Montrose Regional Library has teamed up with Talking Gourds of Telluride to bring a monthly poetry reading series with visiting poets from near and far this winter, spring and coming fall. Open Mic Wednesdays started Jan. 7th at 6 p.m. with Art Goodtimes and Elle Metrick of Norwood. The night before, a First Tuesday, Talking Gourds hosted its monthly poetry club meeting at Arroyo’s Wine Bar & Art Gallery in Telluride also at 6 p.m. featuring Goodtimes and Rosemerry Wahtola Trommer. After featured readers at both of these events, folks are encouraged to bring their own poems, songs, stories or readings of admired others to share with the group. The series skipped February. March 3rd and 4th Leigh Robertson and Erika Moss Gordon of Ridgway were guest readers at both venues. April 7th and 8th, Robert King of Greeley performs. One of Colorado’s poetry treasures, Bob’s Old Man Laughing is a classic. He’s run the on-line Colorado Poetry Center for a number of years. A professor emeritus, he knows how to play to a crowd. May 5th and 6th the featured poets in Montrose and Telluride will be Aaron Anstett of Colorado Springs and James B. Nicola of New York City. May 15-17 Talking Gourds joins with Telluride Literary Arts in sponsoring the Telluride Literary Festival with Colorado Poet Laureate Joe Hutchison, Wendy Videlock of Grand Junction and David Rothman of Crested Butte. Next fall the series starts up again with Bill Nevins of Albuquerque September 8th and 9th, and then continues with Laurie James of Salida October 6th and 7th, Tracy Lightsey’s Montrose Young Poets November 3rd and 4th and ending with the husband/wife poetry team of Ruth Duffy and Michael Olchewsky of Nucla December 1st and 2nd. 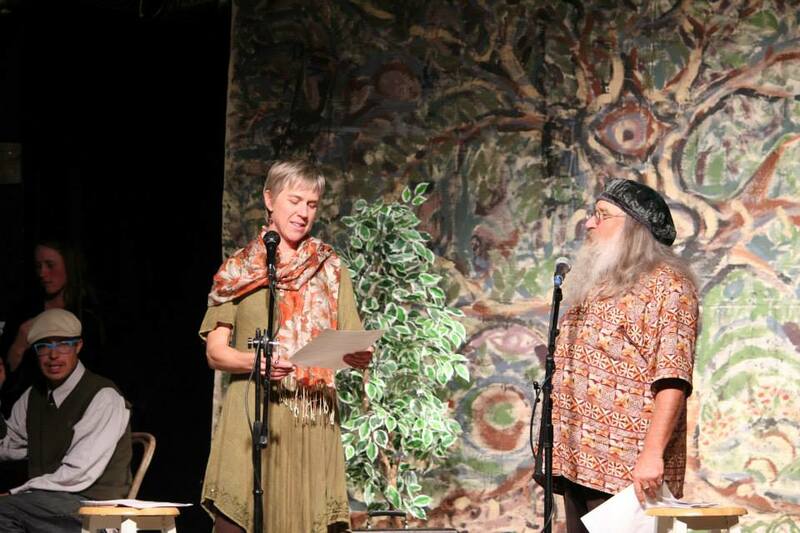 Ellen Metrick & Art Goodtimes at the Norwood Harvest Dinner, October 11, 2014. Image courtesy of the Lone Cone Legacy Trust.